Review: Say YES to JORD Wood Watches | What's the Point? *Editor's Note: I was sent this product in exchange for an honest review. I have tried and tried again to go bright and flashy, but in the end, I always end up with simple and classy. A simple silver bangle. Stud earrings. A white gold necklace. 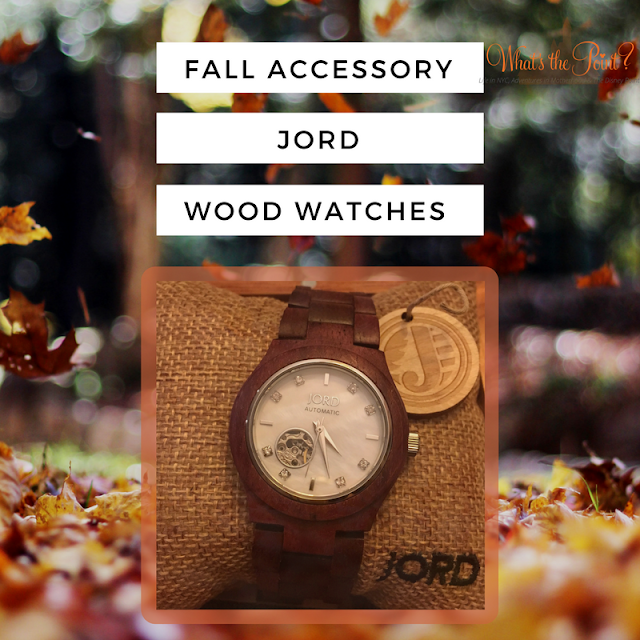 When I first saw JORD Watches, I was intrigued and excited to see how the watch would fit with my simple style. On paper, it seemed incredibly unique! But what I was unsure about is whether it would be too intricate for my simple style. I was also concerned that the watch would be too heavy. Since I work in public relations and am on the computer all day long, I find heavy and clunky wrist accessories to be an annoyance rather than useful. The JORD website is simple to use and gives you all the information you need. Under "Our Wood Watches" you can search all the watches, or break it down and search women's watches or men's watches. Since I definitely wanted something less clunky, I searched just the women's watches section and quickly decided upon the Cora series. Since I'm crazy busy, I like pieces that I can wear with the majority of my outfits so as I'm running out of my house in the morning I don't have to think too much about the accessories I'm wearing. That's why I struggled with the color. I was concerned about purchasing a watch online because I have chubby wrists and most "one size fits all" jewelry does not fit my wrist. In fact, JORD makes it extremely easy to pick the right size for your wrist. Since I didn't have a tape measure handy, I printed out the Wrist Sizer. It was really easy to print it out and measure my wrist. The instructions indicate to add .25 cm to the size you get to ensure the watch fits comfortably. I added a LITTLE more than that because I tend to get an allergic reaction to jewelry that fit too snug. The color of your watch is the natural color of the wood. It's been conditioned with a natural Tung oil to prevent cracking. The sapphire glass crystal is scratch resistant and second in hardness to a diamond. Genuine Swarovski crystals, featured on the dial, get their same signature sparkle from the uniform cutting and lead oxide content in the glass. Your watch runs using a 21 jewel automatic movement. Synthetic rubies are used at each moving intersection to reduce friction and wear. The watch can first be manually wound but then stays wound with the natural movement of your body. You can see the mechanism and its rocking pendulum through the glass window on the back of the watch. Then the next evening when I returned from work my package was waiting for me. Perhaps I'm just a sucker for good packaging but the watch came in an amazing carved wood box that was almost as impressive as the watch. You certainly don't have to worry about it being damaged when it was traveling in style! Do I like my JORD Watch? I love it. I have received compliments every day I've worn it for the past month. People are shocked to hear that it's a wood watch. It's simple yet elegant and the color is very different. It matches pretty much everything I wear at work and at home. It's so much lighter than I ever expected it to be. It's really easy to use. I wouldn't hesitate for a second when considering a JORD watch! Do you have any questions, let me know in the comments below. Visit the JORD Website by clicking the image below!